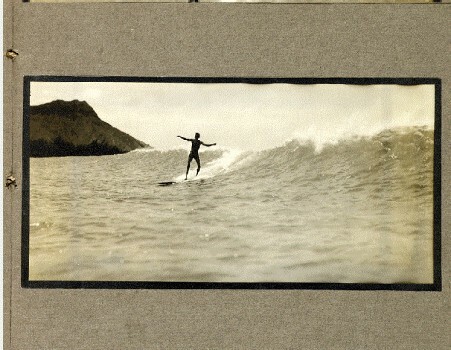 Duke Paoa [Kahanamoku] : Riding the Surfboard, 1912. Volume 6, Number 7, November 1912. 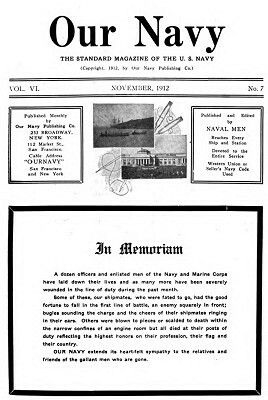 The article largely reproduces the text and some images from a two part article previously published in the first editions of The Mid-Pacific Magazine in January and February 1911. In both instances, although attributed to Duke Paoa (Kahanamoku) they were most likely prepared by the magazine's editor and founder, Alexander Hume Ford. There are a number of incorrect spellings and dislocations in the text, particularly on page 16, probably resulting from an inaccurate transcription. The photographs, all by A.R. Gurrey, appear in many other articles of the period. 1908 The Great White Fleet in Hawaii. of his waking hours from early childhood battling the waves tor sport. He is now 21 years of age, and is the recognized native Hawaiian champion surf rider. and some of the results of three years work in surf photography. and meant invariably a swamping of the canoe and soaking for all in it. returned with his camera and one unspoiled negative out of twelve. Would you like to stand like a god before the crest of a monster billow, always rushing to the bottom of a hill and never reaching its base, and to come rushing In for half a mile at express speed, in graceful attitude, of course, until you reach the beach and step easily from the wave to the strand? Find the locality, as we Hawaiians did, where the rollers are long in forming, slow to break, and then run for a great distance over a flat, level bottom, and the rest is possible. Perhaps the ideal surfing stretch in all the world is at Waikiki beach, near Honolulu, Hawaii. women vie today with the white man for honors in aquatic sports. There are great, long, regular, sweeping billows, after a storm at Waikiki, that have carried me from more than a mile out at sea right up to the beach; there are rollers after a big kona storm that sweep across Hilo Bay, on the Big Island of Hawaii, and carry native surfboard riders five miles at a run, and on the Island of Niihau there are even more wonderful surfboard feats performed. A surfboard is easy to make. Mine is about the size and shape of the ordinary kitchen ironing board. it is harder to start the big board, and, of course, on the big logs one man, the rear one, always had to keep lying down to steer the log straight with his legs. At Waikiki beach, Queen Emma, as a child, had a summer home, and always went out surfing with a retainer, who stood on the board with her. Today it is seldom that more than one person comes in before the wave on a single board, although during the past year some seemingly wonderful feats have been attempted. I have tried riding in standing on a seven-foot board with a boy seated on my shoulders, and now I find it not impossible to have one of my grown companions leap from his board, while it is going full speed, to mine, and then clamber up and twine his legs about my neck. Lately I have found a small boy, part Hawaiian, who will come in with me on my board, and when I stand, he stands on my shoulders, and even turns round. Surfboard riding is an art easy of accomplishment to the few and difficult to the many. Club's grounds and the Seaside Hotel. Here, as a rule, beginners learn the art of balancing on the board. The water for several hundred yards out is but waist deep, so that the mallhini [sic] (new-comer) can stand beside his board, wait for a wave, give his board a forward push, jump on, and race in toward the beach before the foaming crest. He quickly learns, lying down, to guide the board by moving his legs, like a rudder, from one side to the other. There is nothing difficult in mastering this portion of the art or surfing, but out in the deepwater it is quite another proposition. There you have no foothold from which to gain a start, which must now be given the board by the power of the hands. the big waves, or "nalu nui," and a long "hoe,' as the overhand windmill stroke that takes you out is termed. 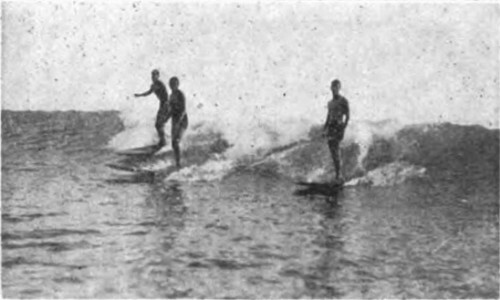 The intending surfer launches his board by grasping it in both hands by the edges, so that it balances, rushes down the slightly sloping beach, and throws himself upon the board as he casts it upon the waters with a forward movement that gives it a good start and sends it beyond the first row of little breakers. of light wood swiftly glides out to sea. To the beginner the exercise soon tires to exhaustion; the neck and back ache, and the points of the ribs that touch the board seem to cut through the flesh. Perseverence, however, overcomes all obstacles, and after a few days new muscle is developed and the stiffness is forgotten. Out in the deep surf, the board goes outward under the waves, a diving tip being given the board just as it bucks each on rushing breaker. Once out where the waves foam, the surfer sits on his board, which, of course, sinks until only an inch or so of the tip is above water, and waits for the wave. Several may pass, then afar off he notices the one he wants. It is coming onward, a great, green roller with a ridge of almost imperceptible spray along its entire length. This is the wave that will curl and break to perfection, then rush on for hundreds of yards - a Niagara of foam. The line of surfers prepares, and as the base of the mountain of water reaches them, there is vigorous and deft paddling with all the strength that skill can put into trained arms, and the great effort is made. Some rise rapidly to the crest of the billow and sink behind it; they have lost the wave. Others keep down in the hollow just before the wall of green. It breaks, and these fortunates are lost in the foam, rise through it, standing on their board, are lifted to the top of the white crest, and by skillful balancing, and guiding their boards with their feet, send them down in the bias until once more they are in front of the on-rushing mass of water. Some of the boards, of course, are divorced from their owners and go sailing in the air, while the surfer dives involuntarily toward coral. Few, however, are the accidents of surfing, and it is doubtful if anyone has ever been seriously injured at this sport which has come down to the "haole" from the old kings of Hawaii. 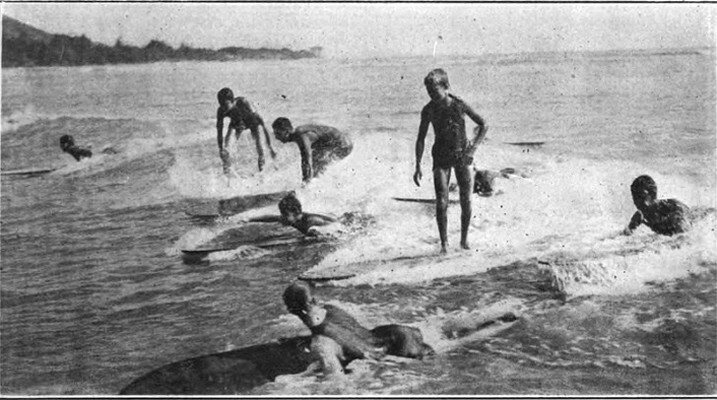 For several years past the sport of surfing had been on the decline, for as the vacant lots facing the beach at Waikiki were taken up by private ownership, the small boy of Honolulu was forced to give up his favorite sport. Copyrighted by A. R. Gurrey, Jr.
boy that the Outrigger Club was formed in April, 1908. The club soon numbered several hundred members. 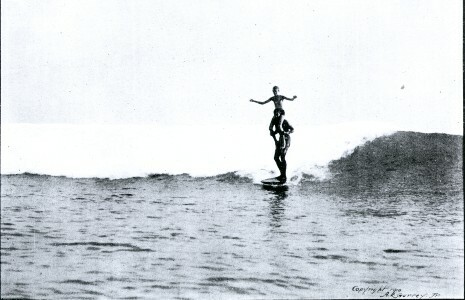 New members were taught to ride stand-upon the surfboard, and so popular became the revival of the old Hawaiian sport that even the ladies began to take a deep interest in it. A number of young girls have learned to stand upon their boards, riding the waves, and together with their mothers and older sisters have organized an auxiliary club. Neither surfboarding nor driving the big native canoes safely before the roughest waves are accomplishments beyond the acquirement of the "haole" or white man. There are white boys fully as expert as any Hawaiian youth, both in the canoe and on the surfboard. A white lad was the first to win a cup at a carnival of surfriders. Mark Twain tried to master the art of riding the surfboard, many, many years ago. 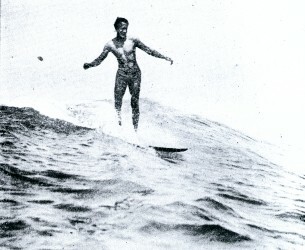 He describes in vivid pen pictures the Hawaiian boys and girls who danced upon the tips of the biggest breakers, and how his board started by a big kanaka, caught a wave and shot with express speed toward the beach, while he shot with equal rapidity down toward the coral bed beneath the waters of Waikiki bay. It is difficult to learn to ride the surfboard without an instructor, but a few simple hints will enable anyone to master the art. The small boys of Waikiki took me in hand when I was ready to take my first lesson on the surfboard. It is their delight to initiate the malihini (stranger). Few of them get beyond the initiatory exercises. I was given a board, a bit or redwood, pointed at one end, not six feet long, about sixteen inches wide and perhaps an inch and a half thick. "Just follow us,'' called one of the three eager tutors selected from the delighted group of would-be instructors. Soon we were out in deep water. Nearly a mile out at sea the big, long billows, for which we were headed, began their thrilling run, to break and reform thrice before reaching the beach. The first bit of advice from my tiny tutors was: "If a breaker does strike us, just duck the bow of your board and it will go through." like windmills as the three boards flew through the water, while mine lumbered on far behind. "Come on!" they called in chorus, and I tried to obey. The windmill motion consists of keeping the arms going around like the sails of a windmill on either side of the board, and strange to say, once the muscles of the arms and shoulders are accustomed to this motion, it tires less than any regular form of swimming. but that first afternoon it did not seem possible that my ribs would not in time wear through the skin. However, I struggled on, and we approached the great rollers. self lifted on the advancing slope of the on-coming billow, three pairs of active young muscles gave my board a great start forward, onward and downward as though shot from a cannon. boys had also plunged forward, using their bodies as animated surfboards, and were riding my wave au-naturel. As it finally passed me by and I came up its rear I could see their smiling, happy faces on its crest turned toward me. There was a chorus of "You were too It did, but the board was left behind. Other youngsters, of all shades and complexions, and far forward on your board," an exchange of gleeful chuckles, and the three youngsters descended on my side of the wave to give me the second degree. "Always let your board go when she starts to dive," one of them urged, "because sometimes if the surf is very high she goes down 'til she strikes coral at the bottom." Another of these cheerful, charming youngsters now thought it time to ask if I could swim. It seems there are persons foolish enough to come out half a mile from shore on a surfboard who cannot swim a stroke. I assured my initiators that I could swim, and, their conscience at absolute peace, they prepared to proceed with the grilling. The advancing water caught it and I lunged would strike and carry me on at great speed, gleaming hides, that shone dripping and resplendent in the sun, had now gathered to witness the sport, and everyone was invited to participate in the giving of the great third degree. I have a vivid recollection of strange shouts, my board almost jerked from under me, shot forward, and I, surrounded by the white, foaming water, began sinking downward as on a toboggon slide, yet onward with the speed of a cannon ball - the spray almost blinding and strangling me; then as I sank, clinging to my board, halfway down the slide of the wave, I could begin to take notice. On either side of me were my angelic tormentors, standing erect on their boards, shouting encouragement and urging me on - as though I could stop in that mad rush of waters, even if I wished to. From the crest of the wave a brown skinned native Hawaiian dived from his board and arose beside me to shout confusing orders in my face - from the other side another youngster dived from his board and arose to grasp mine. It tilted, and there was a shout of glee; it took the great green wall of water on the bias, skimmed along at accelerated speed - diagonally - and I could see the havoc that was coming; boards dove under me - boys over me, and one landed on the small of my back; there was a general confusion and mix up in the seething waters, and I emerged from the third degree coughing and spluttering to be taken In hand for my diploma and final 33rd degree. I was to stand on my board. The wave came, the start was made, and my bit of wood was fairly caught In the rush of waters. Steady and even she rode the wave, then the cry came to "stand!" There was a rapid divorce from my board; we met later, and I was pulled away from the wreck. Unanimously it was agreed that I had earned my diploma, and was worthy to learn the art of riding a surfboard. "But I can ride," I expostulated. "Come on, then - let her go!" Instantly all hands began to paddle - the windmills were in full swing and the boards shot through the waters (all but mine), caught the advancing slope, slid downward, and were carried in in the rush. I sank back behind the wave with my board as though I had never made an effort to go forward. Again and again the attempt was made, and again and again failure was the result. It was easy enough to understand just how the thing was done by watching others go through the operation - but that was no practical help. right when they advised, "It takes experience; just keep at it; some day you'll learn the trick, and then you'll wonder how it was you didn't get it the first day." I learned in half an hour the secret I had sought for weeks. A young hapahaole (half- white, half-native) took pity on me. He was the champion surfer of the Island - who, on a brief visit to America once astonished the natives of Atlantic City and was arrested by the police for riding in on an ironing board upon the top of a great roller, to the seeming peril of the hundreds of conventional bathers in the surf - the first time in America, doubtless, that the little board was used in our breakers - and half an hour after this hero took me in hand I was riding the surf to my heart's content. wave was almost upon him, and then spring sideways upon the board, balancing so that resting on the tips of two ribs he could wheel about as on a pivot - then he showed me how, in deep water, to mount my plank with a side-ways motion. My premier lesson was in the shallows. "First," said my instructor, "I want you to learn how to go before a wave; get on your board, now put your arms out straight, perfectly rigid—go." The wave came, there was a gentle shove from behind, I kicked my feet up and down as instructed, and shot forward - it was a complete success. The next time I bent my elbows and slipped back through the wave. "That acts as a brake," said my instructor; "as long as you keep your arms rigid you can go before the smallest wave, but the moment you bend them, back you slide. If you want to get up on your board, jerk yourself up quickly without bending your elbows. And so, with sensible hints here and there, my instructor quickly initiated me into the mysteries of the board; its secrets became mine. When I would get a fair start and bring up broadside to the wave, my tutor was there to stop me. Soon I learned, by balancing myself amidships and waving my legs, from the hips down, either one side or the other, to perfectly guide my board before any kind of breaker. In a little while this method seemed to be acquired most naturally. I was ready now to practice by myself, first in the shallows, springing on my board with a forward shove just before the wave broke, and catching its momentum - and in deep water by remaining on my board and watching for the proper wave. man who knows how to teach, anyone may acquire the art of surfboarding to perfection. Not the exact image, but similar. A familiar sight at the famous bathing beach at Waikiki, Honolulu, Hawaii. The Hawaiian youth, trained to the water from infancy is perhaps the most expert swimmer in the world. The "stunts" executed on their surf-boards may be favorably compared in points of skill and daring with the ski-runners of the Scandinavian peninsula. of much merriment to the natives. necessary in order to cause the board to ride on its crest. KILLS EEL WITH BARE HANDS. "Duke" Kahanamoku, the world's champion swimmer, killed a gigantic eel that attacked and drew him ten feet under the water, with his bare hands on January 27, at Waikiki, Honolulu, Hawaii. It had been choked by the intrepid swimmer. a few months ago on surf-riding, at which sport he is a champion, drew much favorable comment from our readers. Geoff Cater (2016) : Duke Kahanamoku : Surfboard Riding, 1912.